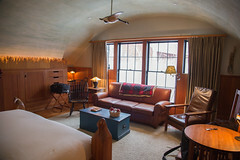 275 Main is basically “Post American” fare like you’d expect at a high-end Vermont country inn: white table clothes, dressed up waiters, romantic lighting, and, of course, the focus on local farm-to-table cuisine. Looking over the menu, we both opted for classic American fare with a nice selection of mixed appetizers. Starting with a pleasant celeriac soup. Celeriac is one of those ingredients that I never feel really gets enough use, or even respect, and it’s a shame, because down well it’s a truly delicious ingredient. 275 Main does it some justice: the soup was just teeming with roasted celeriac flavor, and a wonderfully smooth texture that showed that the kitchen really knows how to work a chinois, yielding a soup body that was smooth and creamy without being overly fatty. 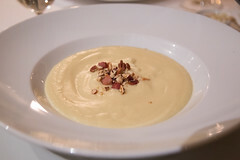 Add in some pecans and hazelnuts, and it was one of the nicest soups I’ve had in recent history. Moving on, the nice part of the appetizer was scallops. 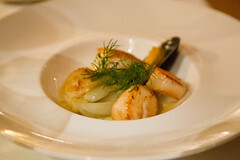 Here, it was more an example of simplicity: a handful of perfectly seared scallops served up with some roasted shallots and dill, the resulting combination of flavor and texture reminded me that, despite our living inland a bit, I do need to occasionally enjoy scallops. 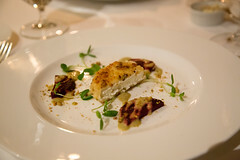 Next up was another example of a simple dish executed really well: deep-fried cheese. A nice slab of delicious house-made mozzarella, pancko-breaded, and served up with some delicious pickled beets, this was head-and-shoulders above your typical fried cheese: a rich, flavorful, and toothy cheese, just barely melting, a nice crispy herbed breading, and a really nice pairing with beets. 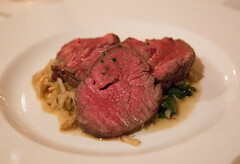 Similarly, when it came to the main course, I went for simplicity, getting a beef tenderloin, served up with a nice butter sauce over a simple gratin. Using a good tenderloin from North East Family Farms Beef, this was the classic example of not overworking the meat: the tenderloin was served up as three thick slices of just-barely-beyond-rare tenderloin, just oozing with beef flavor. I certainly enjoyed it. 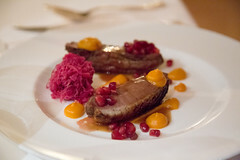 Carol instead opted for the duck breast, which was also nicely done: several slices of rich, medium-rare duck breast, served up with a perfect crisp to the skin, served up in a pleasant prune sauce with a side of red cabbage. Again, really good meat executed perfectly: tender duck, crisp skin, and just a little bit of a tangy sauce. Overall, we were really happy with 275 Main. The Mad River Valley has quite a few good dining options, and I’m pleased that they offer a top-notch dining experience for both guests at the inn and outside visitors. For that matter, they serve up a really pleasant breakfast as well. At some point I’ll have to return to the Inn and check out some of their other accomodations.